Should I get a sofa or a sectional? What fabric should my seating be? What colors work best with our personal style? Have you ever asked yourself those questions? Every seating choice has it’s distinct advantages and disadvantages, depending on your style, your needs, and your space. Here are some tips that may help you to decide which type of seating is best fort you. First you have to consider the layout of your living space. This should determine the shape of your sofa. Square or rectangular living spaces do best with sectionals, while L-shaped or oblong living spaces do best with a sofa living room group. This Signature Design Tibbee Stationary Living Room Group fits perfectly within this oblong living space. The chaise lounge and loveseat balancing the sofa evens out the space. 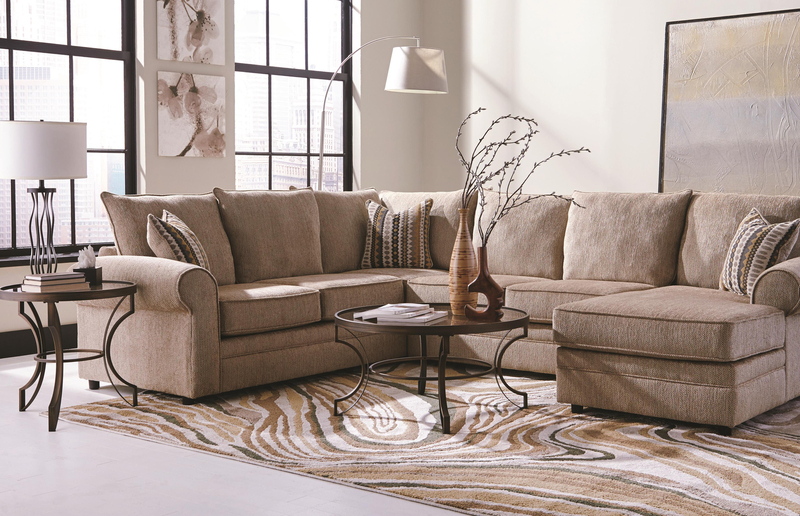 This Signature Design Dailey Casual Contemporary Corner Sectional is ideal for this square living space. It’s subtle curve compliments the room’s angles, offering both form and function to this living space. If you have an L-shaped living space, and you have your heart set on a sectional, use your space wisely. Buy a sectional that’s slightly smaller than what your space allows for, and preferably choose one with a built in chaise lounge. 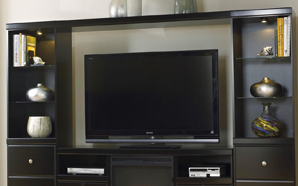 Strategically placing your sectional can “square off” an L-shaped space. This Aquaria 2 Piece Sectional with Chaise by Millennium mirrors the L-shaped room, creating a sense of symmetry throughout your living space. Expert Design Tip: Regardless of whether you have an L-shaped, oblong, rectangular or square living space, if you want to give the illusion of more space, don’t back your sectional or sofa up against a wall. This may seem counter-intuitive, but that space between the couch and the wall makes your room look bigger. 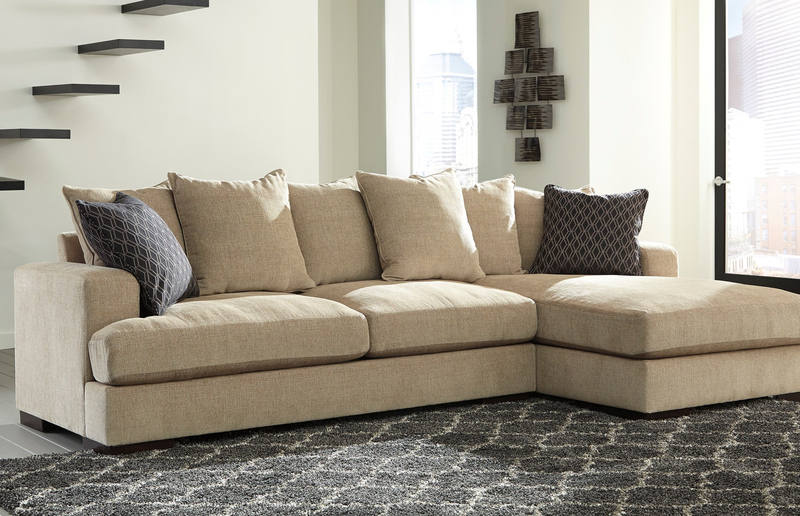 Your lifestyle should determine what material your sofa is upholstered with. If you have children or pets, you may want to opt for an easy-to-clean, durable fabric. If you haven’t started your family, you’re furnishing a formal living room or your furnishing an in-home office space, you may want to opt for upholstery that’s more ornate. 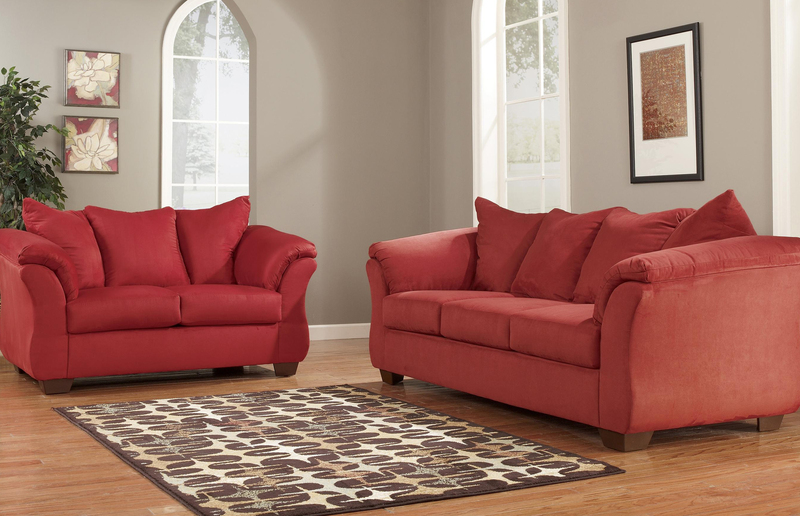 This Signature Design Darcy Stationary Living Room Group in Salsa red is both beautiful and functional. 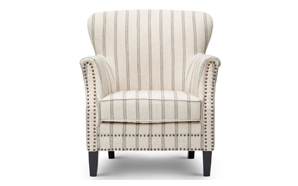 The microfiber fabric upholstering is both soft and durable. It can withstand stains and whatever little hands and paws can dish out. Chenille is a beautiful fabric that’s both soft and beautiful, it comes in a wide range of colors and has a luxurious sheen. But it isn’t the best fabric for pets and children. Chenille is the ideal fabric for a formalized living room, or an in-home office lounge. This Fairhaven Cream Colored U-Shaped Sectional with Chaise offers comfort, sleek lines and the unmatched feel of chenille upholstering. 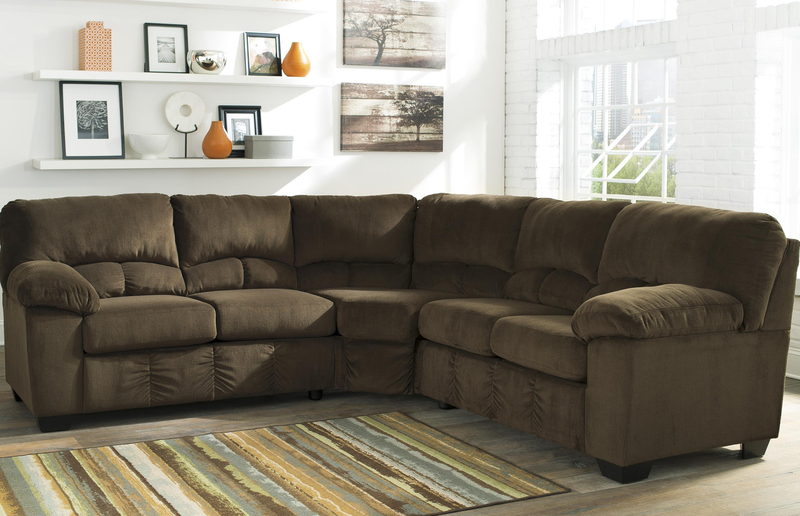 It’s a perfect way to add comfort and class to a living space. The most versatile material for your sofa is leather, believe it or not. Leather has come a long way. Leather furniture oozes class, but most modern leather furniture is more stain resistant and durable than ever before. And the best part about leather furniture is the easiest fabric to clean. 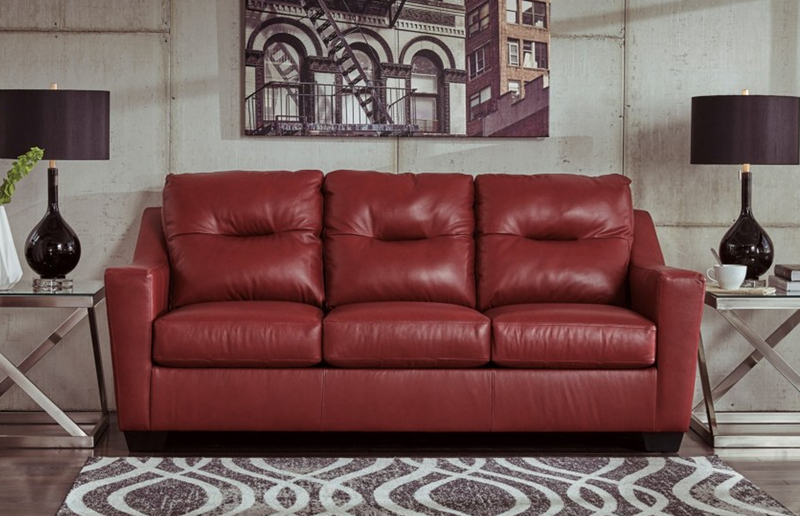 This Kensbridge Leather Match Contemporary Sofa in crimson red is the ideal combination of sleek, modern, comfortable and practical. It’s as easy to clean as it is to love. It can withstand pets, kids and everyday life. And best of all, it’s designed everyday use, but has the look of luxury. Your personal style should dictate the color scheme you use. Your color scheme should reflect your flair, your personality and your inner calm or your sense of adventure. 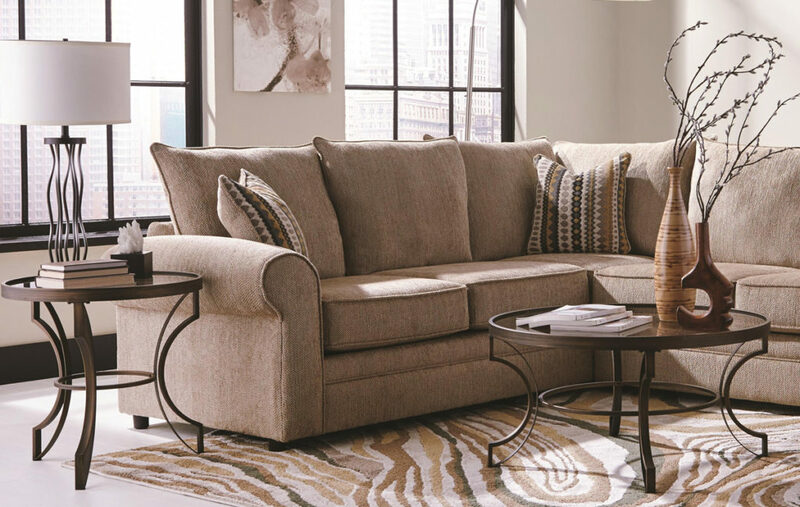 This Signature Design Darcy Contemporary Sofa Chaise with Flared Back Pillows comes in a wide variety of colors to fit anyone’s personal style. The colors featured are (beginning at the top left) sky, salsa, sage and stone. Whether your color scheme is bold and bright or subtle and warm, there is the right hue to compliment your home. Expert Design Tip: Take a photo on your phone of your living space. Make sure to take close up photos of your wall color and your floor color, along with any paintings or decorations you may have. This can help you to find complementary colors when you’re in the showroom. Only buy it if you love it. This may seem line the most simple, straightforward piece of advice, but most people don’t follow it. Customers often settle and are unhappy with their purchase in the long run. Don’t be afraid to ask for help in the showroom, these employees have experience finding just the right seating for your living space. 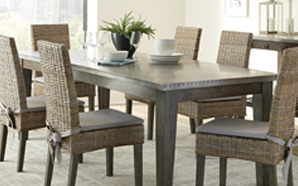 They’re just as eager as you are to find seating that you’ll love. 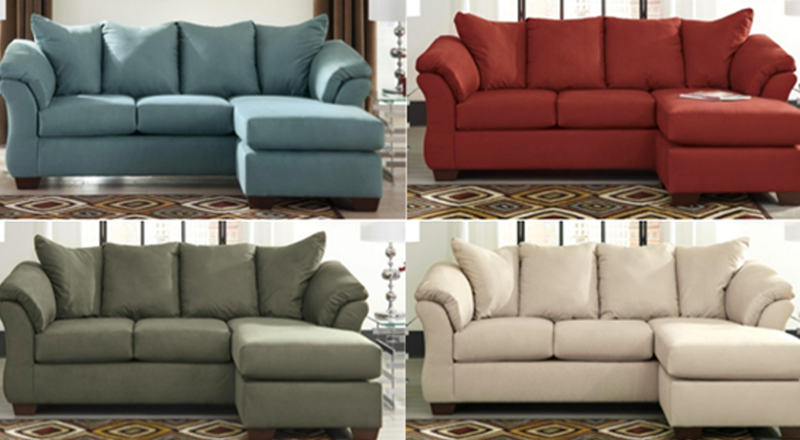 Value City NJ Furniture and Mattresses has decades of experience finding the best seating for your living space. Let us help you turn your living space a room you can relax in and enjoy for years to come. Call or email us today for more information.